After finishing in second place – just a second behind race winner Sebastian Vettel – Kimi had plenty to say about this weekend’s German Grand Prix at the Nürburgring. Q: Tell us about your race Kimi. KR: We had a pretty good last stint of the race, but the cars are close on performance so it’s difficult to overtake. Maybe some more laps would have helped us, but the race is only 60 laps so you have to do your best with that. After my first stop I was stuck behind a Mercedes for a while, but once I was past the car was pretty good. After the safety car three of us were able to pull away, but we were too close on speed to change the order. It was a good day for the team. Of course, we wanted to win; we couldn’t, but we did score the most points here. The warmer temperatures definitely helped us, so let’s hope for some more hot weather in Budapest. Q: You had some radio problems during the race? KR: I could hear my engineers, but they couldn’t hear me. I think it only worked in one part of the circuit and unfortunately today there was quite a lot to discuss. It wasn’t ideal but we managed to do pretty well. Q: Could you have won today? KR: Obviously not, because we didn’t win it. Q: Did the team consider a different strategy for you? KR: I could have run longer on my last-but-one set of tyres and it was a thought to run to the end of the race on them. It didn’t help that we had a radio problem. Maybe we should have taken the gamble and try to go to the end because the tyres were pretty okay, and my speed was pretty okay at that point of the race. Of course, you can’t know what would have happened and we were right with Seb [Vettel] at the end of the race through coming in and putting on the soft tyres. We had good speed and obviously I had some help from Romain to get past. I could have probably passed him in a normal situation but him letting me past saved me a lot of time so we were able to try to win by catching Seb. Q: This was your best ever result in Germany. Does it taste any better than the previous ones or is it only victory that makes the difference? KR: Obviously we are here to try and win races. We couldn’t today because we were not fast enough but for the team it was a good result after a couple of quite difficult races. We lost some more points from the lead as Seb won today, but it’s still a long season and if we keep putting ourselves in a position for at least fighting for first place then I think we can do it again. Could you have won today? That´s very true, leonardo. 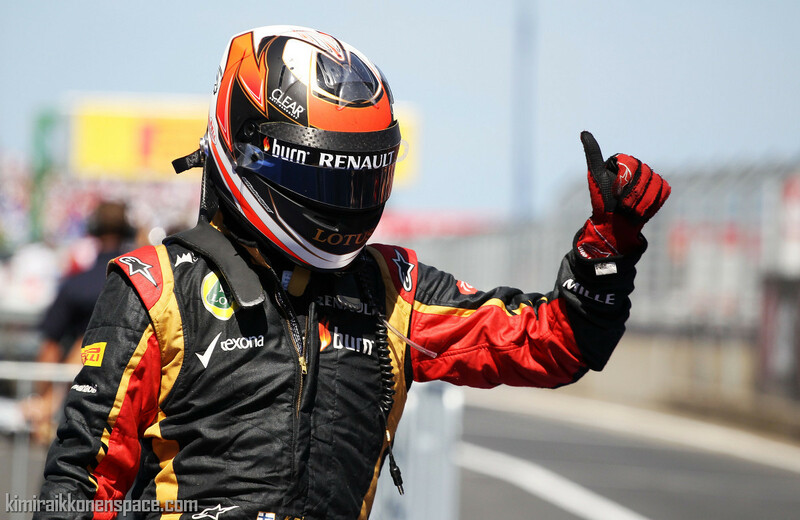 KIMI is and will be a LEGEND for ever and ever! !